President Obama appeared at the White House on Monday to push for an extension of the Bush tax cuts for one year, except for earners above $250,000—there, the president is “100 percent committed” to letting those tax cuts expire, in the words of senior campaign adviser Robert Gibbs. Let’s get this out of the way up front: there’s no way Congress reaches a deal on this before the November elections, nor even makes a meaningful effort. Republicans think they could win control of the Senate, so there’s no reason to negotiate now from a weaker position, and Democrats believe the same about their chances to retake the House. 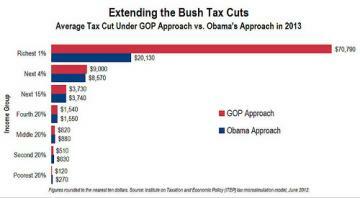 Rather, tax justice is clearly something Obama’s team believes can be a powerful election-year narrative. (A belief no doubt shared by Republicans, for inverted reasons).